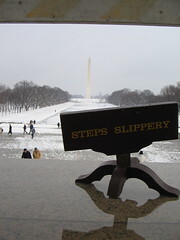 New photos of this season’s DC in the Snow series, with photos taken of the last two snowstorms we’ve had since January of 2005. If you haven’t seen it yet, you can also check out last winter’s Pencam series of a snowy DC. As for today’s “snowstorm,” that was pretty pathetic, wasn’t it? Especially after last night’s breathless TV forecasts of massive accumulation values of anywhere from two inches to hundreds of feet. Barely an inch so far, if that. Well, the snow’s still coming down, with two more fast-moving bands of heavy precipitation headed north towards DC, so maybe we’ll see at least a couple of inches before today is over. My sister went to D.C. in Jan 1995 for something to do with school. One of the times she called our house she told Mom that it may not be colder up there temperature wise but since it’s such a dry cold compared to here, it felt much colder.